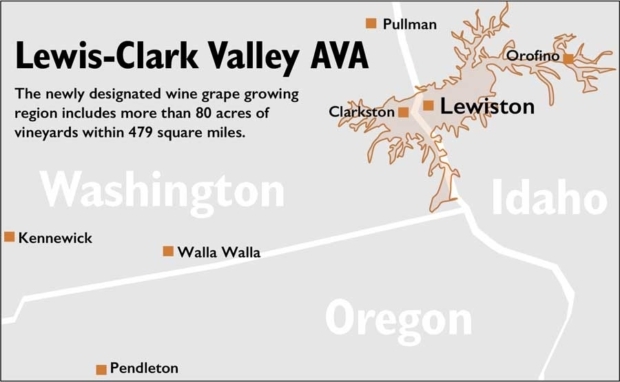 On May 20, Idaho was awarded its third AVA, Lewis-Clark Valley, which crosses the Washington state line and includes some Washington vineyards that weren't happy about it. Under new TTB rules, which prevent overlapping AVAs, those Washington vineyards were taken out of the Columbia Valley AVA and plunked into the new one, 72% of which is in Idaho. Their objections are part of the reason the Lewis-Clark Valley AVA took seven years to be approved, but as Deb Smith of the local economic development association said, "We're not based on boundaries. This AVA is based on science." 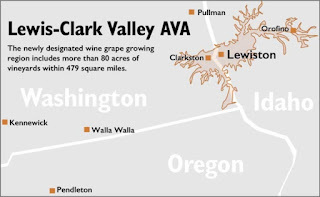 Right now, very little of the wine made in the 479-square-mile AVA is from Lewis-Clark Valley grapes. There aren't many grapes to go around, with 16 vineyards representing about 80 acres total. That will change, because it's definitely farmland, and not for potatoes as you might expect. Wheat is the primary crop, along with lentils, garbanzo beans and canola used for oil. Driving through Lewis-Clark Valley is like driving through the song "America the Beautiful." Several times we stopped to take pictures of the amber waves of grain, studded with fields of brilliant yellow canola. Idaho is underappreciated as farm country because most of its products are not artisanal. Did you know it's the nation's third-largest milk producer? But most of that milk ends up in supermarket-brand cheese. Wine grapes are a passion project; they are the entry into a different side of Idaho. Lindsay Creek Vineyards' owners, brothers Art and Doug McIntosh, are fourth-generation wheat growers. "In 2001, I went down to Walla Walla and saw a vineyard in the middle of a wheat field," Doug McIntosh told me. "We have a 2000-acre wheat farm. We put a vineyard in the middle of it." They also built an enormous winery outside of Lewiston, and both brothers went back to school to learn viticulture and winemaking. So far it hasn't been a particularly sensible investment. "We've had some freeze events," Doug said. "The event that we had over here killed them right to the roots. A lot of the vines have been replanted. Probably one out of 10 years we'll have a problem." But they have a winery so they've been buying grapes from Washington and making wines with a modern philosophy. "We've made the conscious decision to keep the alcohol levels low, to keep them below 14%," Art McIntosh said. "We think it brings out the fruit more. We just do it at harvest, picking at lower brix levels." Their 2010 Counoise was terrific: spicy, light-bodied and complex, and just 12.7% alcohol. Unfortunately that's not what the Washington grower was looking for so he regrafted that vineyard to Syrah. But it portends well for what the McIntoshes might make when they finally harvest their own grapes. Clearwater Canyon Cellars owners Coco and Karl Umiker are also multigeneration farmers. Her family arrived in western Idaho in 1916 and have been raising grain and cattle. "When we planted (grapes) in 2003, everybody thought we were nuts," Coco told me. "My grandfather was old enough to remember the wine grape industry here." She has a photo of a vineyard a century ago that was across the street from where her house is now. Idaho had grapes and local wines from the 1860s until the state decided to impose Prohibition in 1916 (just couldn't wait for the feds). Not until 1970 were grapes planted again, and not until 1976 was there a bonded winery. The Umikers now have one of the larger wineries, making 3000 cases a year and selling them all. They just broke ground on a new 5000-square-foot winery behind their house, intending to increase production to 5000 cases. Their wine business is successful enough that they're renting the rest of the 70-acre family wheat farm to sharecroppers. "We have a very developed wine club," Karl said. "We're really only selling in the state of Idaho, and a little bit in Washington." In fact, Idaho has little need to send its wine to other states. Now there are 51 wineries, but the level of wine production is still so small -- less than Maryland or Illinois -- that the locals can drink it all themselves. Idaho drinks more wine than you might think. Per capita, its residents drink 8 liters a year, below the national average of 10.6 (fun fact: Virginia is the most average state) but more than Michigan, Ohio or Texas, which are considered more important markets. So the reason the state invited a few writers, including myself, to visit wasn't to inspire a thirst in California drinkers for wines from a new and exotic region. Instead, similarly to Canada, it was to give Idaho drinkers validation from outside sources that their wines are as good as anyone's. Some of them certainly are. 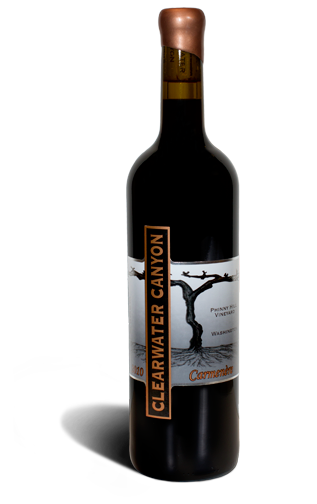 Clearwater Canyon made a 2014 Syrah from their Lewis-Clark Valley estate vineyard ($28) that has nice fruit and northern Rhone earthiness. My favorite of their wines is a 2014 Carmenere ($28) from fruit purchased from the Phinny Hill Vineyard in Washington. Buy these wines here. The big question for a young region like Lewis-Clark Valley is, what grape varieties will do best? It's way too early to answer that, and I hope farmers don't make their decisions based on which varietals sell best nationally. Right now blends are a good bet. Colter's Creek makes a nice red Bordeaux blend with the unwieldy name of "Koos-Koos-Kia." The 2012 ($22) has plenty of fresh herb character with good texture and balance. (Buy the 2013 here.) I also highly recommend dining at Colter's Creek if you find yourself near Juliaetta. On our last day in Idaho we visited the Coeur d'Alene Resort, where the restaurant Beverly's has a world-class wine list that it claims is the largest in the Pacific Northwest. I spent 20 minutes with it and I won't argue. Beverly's wine director told me that people from California come to the resort expecting to drink California wines and many aren't even aware that Washington makes fine wine, much less Idaho. Well, Idaho wine drinkers, take pride. Like the explorers who it's named after, Lewis-Clark Valley is on a journey with an unknown end, but there are already some beautiful spots to savor. Given the state's (seeming) disease isolation, are any of these vintners planting vines on their own rootstock? Not many that I talked to. This region is not that isolated, as Columbia Valley AVA sits on its western border. I didn't get into the nitty gritty of whether or not they use equipment and personnel from Columbia Valley, thus creating a risk of transferring phylloxera, but I'll bet they do. I also am a fan of the Lindsay Creek Counoise - and I was stunned by the beauty of their winery. I'm with you Blake, Idaho wines are worth trying!